Wild Magic is about Daine. A girl who can talk to animals. She owns a horse named Cloud who guides her through hair-raising adventures. It's a teen fantasy! It's awesome! This book is really good and is quite dramatic. But still good. I have read the book and it's really good. It's my favorite book and I would recommend this book to other girls. There's also another book in the series called Wolf Speaker. The author is Tamora Pierce and she has written many other books including a series called The Lioness Rampant. 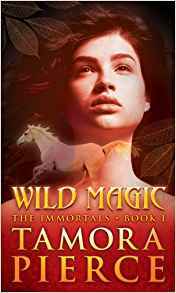 I absolutley LOVE thos series and Tamora Pierce. I have read all of her books that are out and really hope she continues to wrie such amazing books. Please be advised, the series is for teens and older, I would NOT reccomend for younger children because of content later in the series. That goes for most of her series. I have read the book. It by Tamora Pierce.It takes place after her first series The Song of the Lioness.